"Yuriko Yamaguchi’s Mixed-Media Clouds at Adamson Gallery"
In computing, “the cloud” is just a metaphor. In the art of Yuriko Yamaguchi, it becomes compellingly tangible. The Osaka-born Yamaguchi, who’s been working in the U.S. since the 1970s and who is now based in Vienna, Va., uses steel, copper and brass wire along with small pieces of hand-cast resin to create sprawling modular networks that suggest communications networks with an uncanny lightness. One of these early works is on display at Adamson—a shower of resin and wire that telegraphs the promise of Yamaguchi’s more recent works but which is hampered by its overly monochromatic palette. Yamaguchi’s more recent work—a series she calls “Cloud”—represents an improvement on this approach, seamlessly blending art with biology. One piece, “Coming,” features two nodes linked by a long, thin connector—a virtual axon and dendrite, those carriers of electric impulses that power the human nervous system. Another, “UR #1,” is vaguely heart-shaped, lit by the warm, red glow of LED lights. 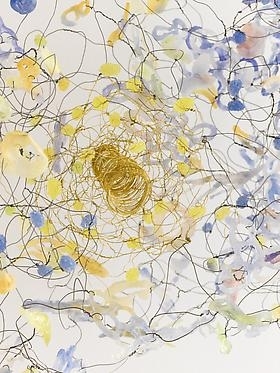 Yamaguchi’s pièce de résistance, however is titled, simply, “Cloud” (top and bottom). Up close, “Cloud” is an organic but orderly agglomeration of cast resin and wire. Viewed from a distance, however, its four distinct parts are harmonious, forming an utterly convincing cloud, palpable but evanescent. Yamaguchi’s work, more than most artists, pretty much nails what she set out to do. Through June 14 at Adamson Gallery, 1515 14th St NW, Washington, D.C.